I love watermelon but half of my family could care less...insert sadness, shock and disbelief! Not having a crew that doesn't share my love means I'm consuming watermelon for days but even I reach my consumption point, I either forget about the other half or by the time I remember it's starting to turn bad. 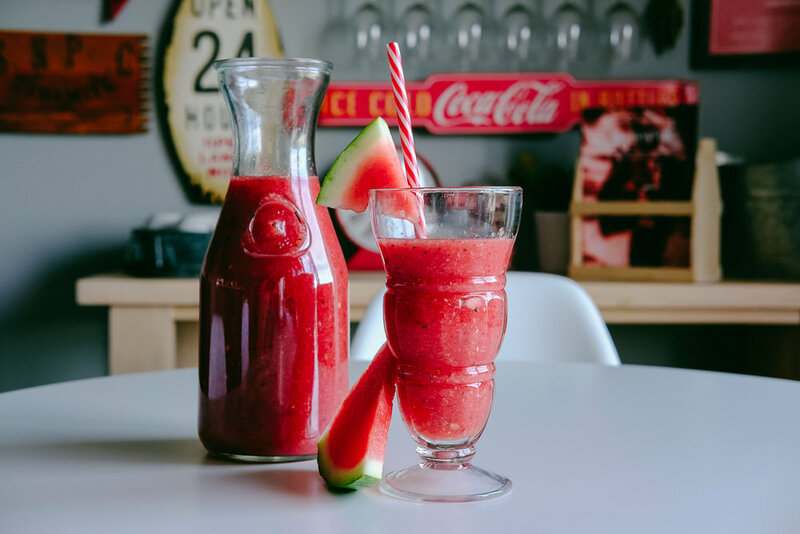 Enter in a new use, watermelon smoothie mashup! Light and fresh, I found it's a great way to use up a melon plus you can freeze it for future enjoyment when winter arrives! Because I still had some leftover, I kept the remainder in the fridge for 4 days, giving it a stir and pouring over ice or adding to mineral water for a refresher lighter drink. A search on Pinterest and there are a few variations but part of the fun is not always sticking to the recipe but playing to see what suits your tastebuds. Enjoy!